Common signs include streaks on your windshield, wipers that bounce as they operate, screeching noises, and visible damage to the wiper blade refill. In order to effectively clear your windshield of water, dirt, bugs, or other debris, you have to have windshield wiper blades that are in good shape. Most automotive experts, and manufacturers recommend that the windshield blades be replaced every six months. Other car owners choose to replace the blades as needed or when they have their oil changed. Regardless of what maintenance method you choose, we can all agree that this needs to be done in order to have a clean windshield daily. Replace the wiper blade cartridge that attaches to the wiper arms. This includes the pivoting portion of the wiper blade and the rubber strip that touches the windshield. Replace the wiper refill that attaches to the wiper cartridge – or the rubber strip specifically that fits into a slot on the wiper cartridge. There are many pros and cons of each replacement method as well as the fact that some automotive manufacture wiper blades are not available with the insert refill option. If you choose to replace your wiper refill as needed, there are a few important warning signs that will alert you that it's time to replace them. If left unchanged however, the wiper blades can completely wear out, cause damage to your windshield, and in some cases, additional damage to other windshield wiper components. Listed below are a few of the warning signs of a worn out windshield wiper refill. The first and arguably most obvious sign that the wiper blade refill has worn out is if there are noticeable streaks on your windshield as you activate the blades. When your wiper blades are in great shape, they will remove water and debris from your windshield evenly. This means that you won't notice smears or streak marks on your windshield after they move from left to right. However, when the rubber part that makes up the blade refill gets old, it hardens, becomes brittle, and is susceptible to inconsistent operation. However, the main drawback is that the wiper blade loses elasticity which makes it difficult for the blade to maintain even contact on the windshield for proper operation. If you notice that your window has lots of streaks every time the blades operate, it's a good warning sign they need to be replaced. 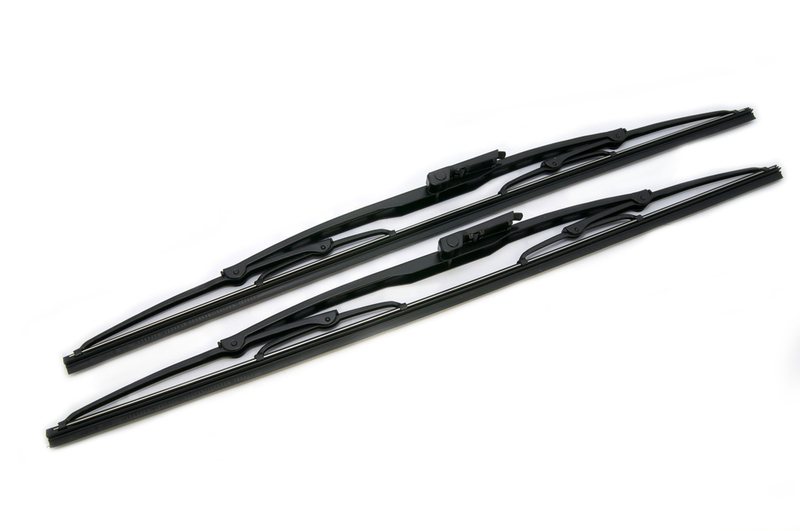 The windshield wiper blade refills should smoothly glide across your windshield when they are in good shape. When they appear to bounce, it's most likely due to two things; the windshield is too dry or the windshield wiper blades are wearing unevenly. Most of the time wiper blades are not turned on unless there is water on the windshield so the second option is more likely to occur. If you notice that your wiper blades are bouncing or running rough on the windshield, replace them as soon as possible. A good wiper blade will operate quietly when it's in use. A worn out wiper blade will tend to make a screeching noise as it moves across the windshield. It's also possible that you'll hear a grinding noise when the windshield wipers are moving. If you hear either, it's a warning sign that the blade itself is worn out beyond repair. It needs to be replaced as soon as possible to avoid scratches in your windshield or breaking the wiper arm or the wiper motor. The best indication that the wiper blades need to be replaced is when you notice visual damage to the blade. A good rule of thumb is to inspect your washer blades when you fill up the fuel tank. This is very simple to do as you can simply lift up the blade and see if it's smooth to the touch as you run your finger across the blade. If it looks torn at all, you should replace them immediately. Having a clean and clear windshield is critical to your overall safety and the safety of all those on the road. Many accidents each year are caused because drivers can't see outside their windshield. However, most insurance companies find these drivers negligent and liable for damage to their own vehicles and others. Make sure if you notice any of the above warning signs that you replace your windshield wiper refill or the entire wiper blade cartridge. If you need assistance with this job, contact one of our local ASE certified mechanics who will be happy to complete this task for you. Still not sure about your car's issue? What kind of issue are you experiencing? Q: What Size Wiper Blades Does My Car Need?